Check the stability regularly. Screws may loosen and need to be tightened. Size of Camping Stool: Unfold Size: 10x10 x 10.2 inch (L*W*H); Fold Size: 9.8 x 4.7 inches (L*H); Maximum Load Weight: 220lbs. Durable Material: The Folding Stool is made of 600D double oxford cloth and high quality steel pipe. The steel frame is ultra-light but can hold 220 Ibs. The four-legged design can provide better support which can use for a long time you won't be tired. Portable and Easy to Carry: Outdoor portable stool is small and only 1.5Ibs,It is can be folded to be a small size chair when they are not in use, which can save much space. When you are camping, you can place the camping stool in your backpack easily. 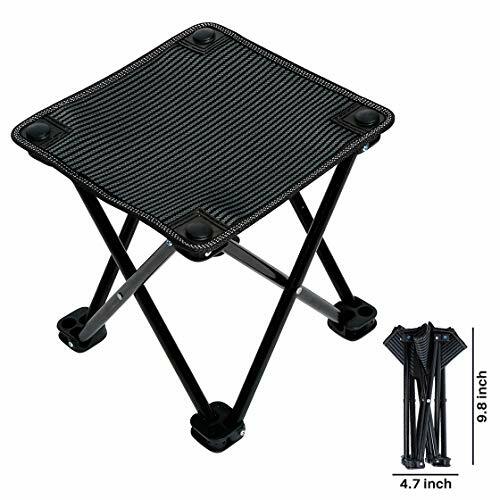 Multipurpose: Folding camp stool is ideal for outdoor and indoor activities, perfect for camping, hiking, fishing, sports meeting, garden, traveling, beach, picnic, barbecue, yard, patio and more. It's also a great gift for elder person who often queue up for the bus. 100% Satisfaction Guarantee: If you are not satisfied with mini folding chair, please feel free to contact us firstly, we will solve your request , return or refund is available, will make you 100% satisfaction. If you have any questions about this product by Gelma, contact us by completing and submitting the form below. If you are looking for a specif part number, please include it with your message. EARTH “EASY-SEAT” CAMP STOOL w/ STEEL LEGS, COMFORTABLE NYLON FABRIC, 3-LEGGED OUTDOOR FISHING STOOL, SIT ANYWHERE!